The Dow Jones Industrial Average is having a great day today, which is a sharp contrast from what we’ve seen in the market as of late. Now, investors are starting to ask… Has the Dow reached the bottom? In my opinion the answer is no! In fact, I believe that declines are far from over. 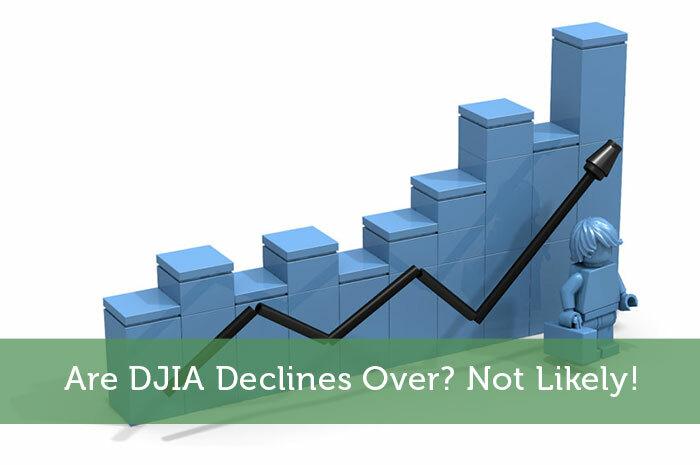 Today, we’ll talk about why we can expect to see a continuation of declines on the Dow Jones Industrial Average and when declines may come to an end. China – Experts all around seem to be blaming China for the declines we’re seeing around the world. While I don’t believe that issues in China are the only issues causing declines, it’s clear that they are playing a big role. With that said, China’s economy is struggling in a big way, and those economic struggles have bled into the Chinese market. Because China is the world’s second largest economy, this creates a bit of a problem for the global economy and marketplace, adding resistance to stocks around the world. Oil – Oil is also playing a major role in the declines we’re seeing on the Dow Jones Industrial Average and just about any other stock market index around the world. That’s because oil is the deciding factor with regard to values in the energy sector. Since the commodity has been struggling since the end of the year 2014, it has been driving the energy sector downward, effecting causing pain for the market as a whole. Global Economy – Markets tend to perform best under positive economic conditions. However, economic conditions around the world have been anything but positive. Poor global economic conditions are causing further resistance on the DJIA and other stock market indices around the world. Have We Reached The Bottom Of The Slide? As mentioned above, because we’ve started to see positive movement in the market today, investors are starting to wonder whether or not we’ve reached the bottom on the most recent declines. Unfortunately, I don’t believe that’s the case. The reality is that the market isn’t likely to see widespread long term gains until until the issues above come to a conclusion. The truth is that it has taken several years to get to this point. The oil supply glut didn’t happen over night. For several years, the world has been producing far more oil than it has been using, leading to the oil crisis today. Unfortunately, the trend in over production is continuing. On top of oil, economic conditions around the world didn’t fall apart over night. It took some time for Europe, China, Brazil, and Japan to get to the points where they are today. While the governmental bodies in all of these economic regions have worked to improve economic conditions, the efforts haven’t bore fruit quite yet. The bottom line is that the bear market isn’t likely to last forever. However, it’s not going to come to an end today either. In my opinion, we’re likely to see declines for the next several months while solutions to the world’s problems are created. Where do you think the DJIA is headed and why? Let us know your opinion in the comments below!